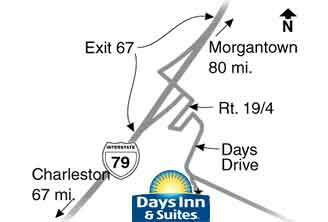 From the South (Charleston): Take West Virginia I-79 North to Exit 67 Flatwoods Exit. Turn Right at the Stop Light. Approximately 100 yards Turn Left onto Days Drive. Follow the Days Hotel signs up the hill.